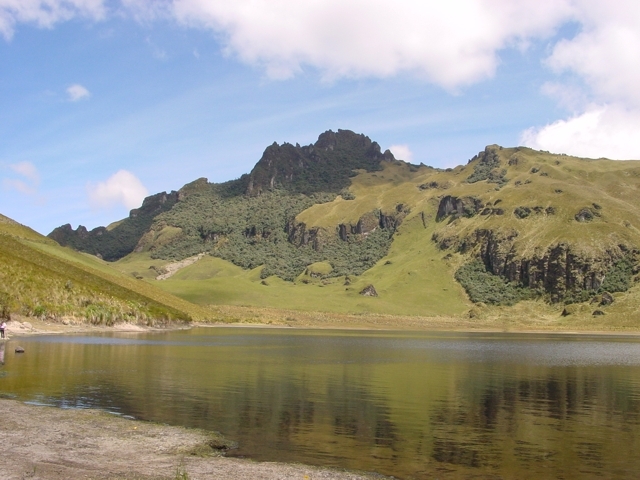 Otavalo and its surroundings have many attractions. - located between Modesto Jaramillo & Salinas and Sucre & Quiroga - a few blocks away from the Bus Terminal. Make sure to use your business skills, as in other country, here too you can get merchandise for about 20 to 30 percent lower than the offered price. Buy everything you can - you'll be glad you did. A lot of the products sold here are made by people from nearby villages - Tanguarin, Santo Domingo & Vella Vista. These places have a number of excellent artists. Yaguarcocha - near the city of Ibarra. Cotacachi - where you will find all sorts of leather goods. El Chota - a very hot place indeed. A number of the football players in the Ecuadorian team came from this area. La Esperanza - South of Ibarra- beautiful vistas. It gets quite cold at night. Be sure to be there at this time, you will have a great time. Drink for me - Don't drive. YAMOR - September 1 to the 18th. San Luis Obispo - August 15 to the 22nd. Sanjuanes - June 24 to the 29th. While in Otavalo you may also visit the church "El Jordan," relax at el "Parque Central" (Central Park) or get some literature at the Archaeology Museum - "Museo Arqueologico de Otavalo"